LONDON City Airport (LCY) has become the first airport in Europe to install Aviation Grade Artificial Turf (AGAT) – an innovative new form of groundcover, which has been described as being “future-proof”. LCY commissioned the installation across an area of approximately 400 m2. Airport officials were looking for a long-term and eco-friendly solution to the ongoing problem of bird strikes, jet blast and erosion, as well as a reduction in maintenance costs. The Civil Aviation Authority (CAA) has agreed for the trial to take place. The groundcover was installed by Denmark-based AGAT specialist Evergreen Aviation on the 5th and 6th of August in the jet blast area of Runway 27 and Taxiway M. Airport staff have reported that AGAT has been a welcome addition to its runways. “Since the installation, there have been no issues with the AGAT,” he added. “Airfields are always being inspected and there have been no issues reported so far. We had some extremely heavy rain soon after the installation and it performed very well in these conditions with no saturation reported. “We believe that AGAT represents the future of airport groundcover,” says Nikolaj Duckert, technical director of Evergreen Aviation. “In fact, it is the only future-proof groundcover on the market. 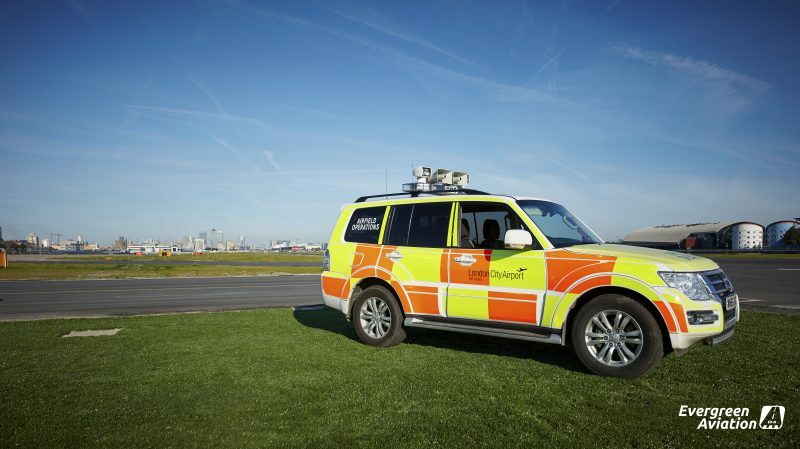 “It was a pleasure to work with the staff at London City Airport and to help them come up with a trial solution at Runway 27”. AGAT is sustainable, easy to maintain, and has a proven ability to reduce and prevent jet blast erosion. Furthermore, the short length of the grass and lack of flora means that birds and other animals will not be attracted to the area to hunt for food or shelter. This in turn reduces the risk of bird strikes on aircraft – a particular concern in city-centre airports. Reduce non-fatal bird and animal strikes. It is particularly effective at eliminating erosion from the jet blast of turning airplanes. This ensures that the runway remains in good condition, no matter how busy it is. The AGAT installation at London City Airport was carried out during operational closure on a Saturday afternoon and overnight into Sunday morning by County Building Services Ltd, which is a construction and civil engineering supplier to the airport. This was done under the supervision of Evergreen Aviation. AGAT is a synthetic turf filled with silica sand, which creates a unique permanent surface cover. The components are 100% recyclable, UV and chemical resistant, and they leave minimal environmental impact when compared with asphalt and concrete, which permanently pollute the natural infill. It has been approved for extreme weather conditions, from -72C to +65C. Ice and snow can be removed without damaging the turf, and without the need for de-icers. The coloured UV resistant fibre of the turf repels water, so that the colours of the turf can be clearly seen in any light setting. Based in Copenhagen, Denmark, Evergreen Aviation (EA) is a leading provider of AGAT worldwide. Since it was founded in 2009, EA has developed a number of new applications for AGAT, including the AGAT Helipad, which was designed for military and civil aviation use in the US. EA also provides safety and efficiency to airports worldwide through a large number of different applications. The firm strives to use local workers, skills, tools, machinery and materials, and every installation is carried out in the most environmentally friendly way. Evergreen Aviation is based in Kokkedal Industripark, Copenhagen, Denmark.